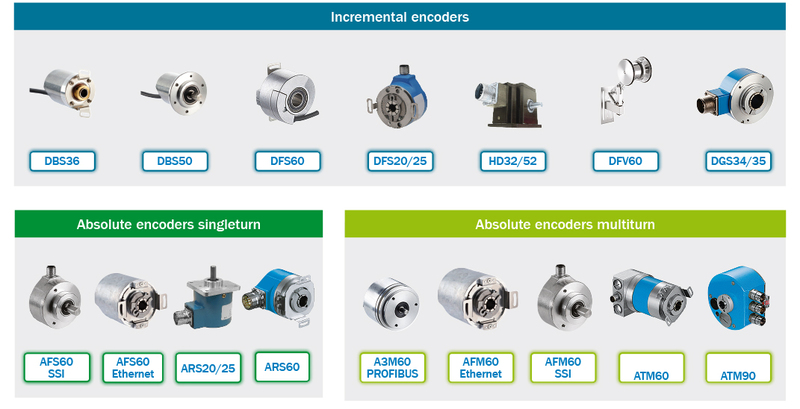 Two of the most common encoder types — absolute and incremental — output different information. Take a look at the quick one-minute video below from one of our engineers to get a better understanding of the differences. As the video explains, an incremental encoder is an encoder that outputs either a square or a sine/cosine wave. The number of periods can be counted with the sin/cosine output, while the number of pulses is counted for the square output to obtain speed or velocity information. Incremental encoder feedback is generally used in industries such as packaging, printing, conveyors and converting for speed and velocity control. In contrast, an absolute encoder outputs a unique positional value for each shaft position. This value is obtained over SSI, Profibus or Ethernet interfaces. Absolute encoder feedback is typically used in transport logistics, robotics, packaging and staging systems applications to control and monitor position. One of the biggest different between the two types of encoders is the positional information. With incremental encoders, positional information is not retained after a power cycle while an absolute encoder will tell you the exact position on power up. For additional information about SICK’s family of encoders, download the Selection Guide for Encoders. Where do you use incremental and absolute encoders in your facilities? Tell us in the comments section below. As a Strategic Industry Manager with SICK, Inc., Vikram is responsible for the Electronics and Solar markets. He has worked in the industrial automation field for eight years, and his principal interests are learning about innovative products and technology. Vikram currently resides in Minneapolis, Minn., is passionate about traveling to different countries, sports, multicultural experiences, and is an avid Manchester United fan. Top 5 Blog Posts of 2017!